Explore your turn in Neon God! Listen up, you reeking joovs! We got a fresh new preview for Neon Gods that every gang boss worth a blurp, needs to put two eyes on! Are you ready to rule your blocks and take your gang skyways? It’s gonna take plenty of fresh meat, the skills to bust Andys, and a healthy fear of owls. Today we’ll be looking at your starting gang and how you’ll use them every round. Gizzer! Each gang is made up of a combination of gang member cards. Gang members are broken up into seven categories: bandits, builders, charmers, docs, merchants, warriors and generals. The category of these gang members will give you some insight as to how they work. Warriors are good at fighting, bandits excel at stealing cash money from your opponents, etc. While each player starts with a deck of basic grunts, you’ll have the opportunity to add more powerful gang members to your deck as the game goes on. Use this to customize your strategy to dominate the city. 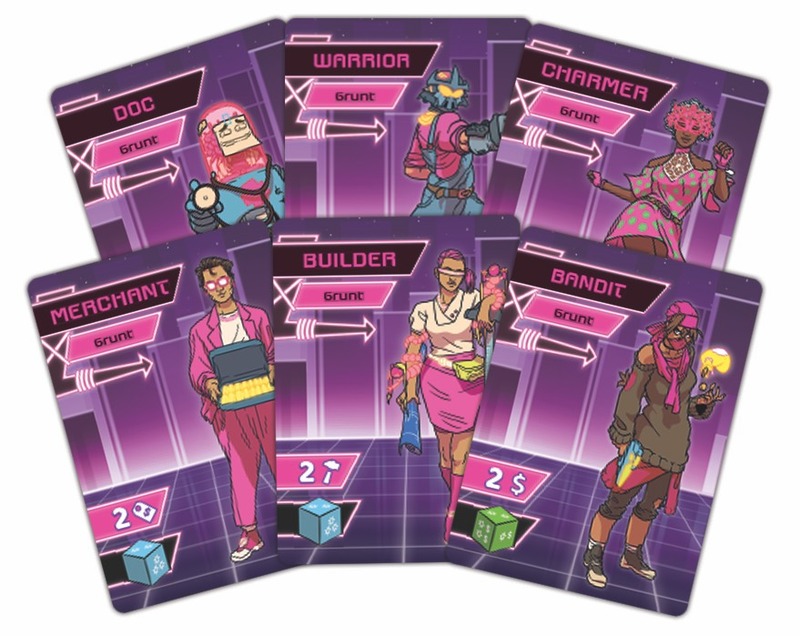 Each time you add a new gang member to your deck, you’ll also get another figure in your color on the board to help maintain your presence on the streets. Turns in Neon Gods are pretty simple. All you gotta do is follow the instructions on your player board one at a time. First, you draw a new card from your deck. Then, you can either draw another card or recruit a new gang member from the Recruitment Board. After that, you’ll move up to two figures you control on the board. Next, you can activate up to three card effects from your hand. Each gang member card has an effect you can use, such as moving additional figures, selling product tokens, recovering cards, or even using the effect of work cards. Remember, you’re limited to three card effects a turn, so pick them wisely! Finally, if any of your figures ended up in enemy territory, you gotta battle! We’ll cover combat in a future article, but just know that you’ll be able to play gang member cards into the fight for bonus dice. That’s all for this week! We’ll have another preview soon showing off some of the finer points of scrapping and chasing blurp, so be sure to check back soon. 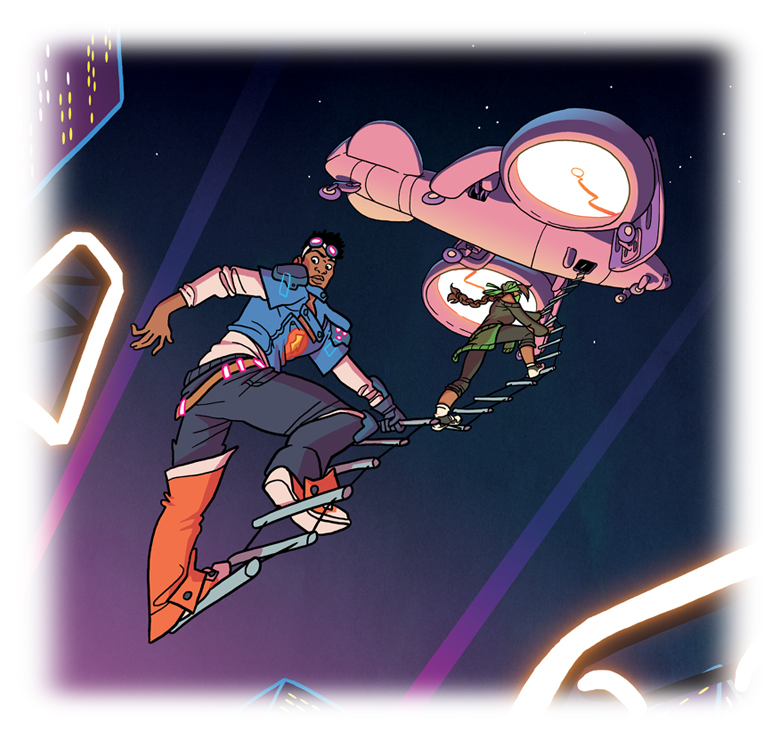 Remember, Neon Gods is available for preorder now and will be hitting retailers later this month!